I made this for Rackycoo in the One Tiny Thing 17 Swap. I got the idea from the Carol Duvall Show. Here's a link to her tutorial http://www.hgtv.com/hgtv/cr_paper_crafts_boxes/article/0,,HGTV_3289_1399648,00.html That link is dead now , I added my version below! 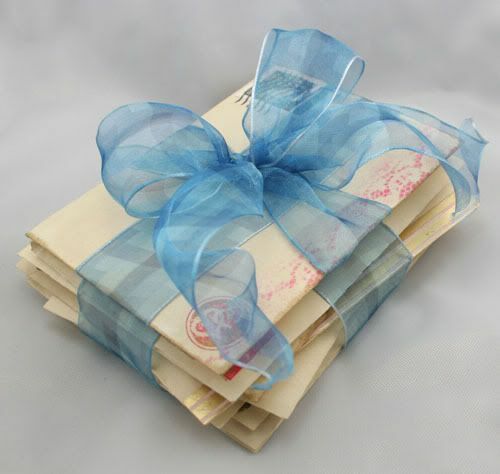 I started with plain ivory invitation envelopes. I didn't think they looked aged enough, so I dyed them with loose leaf caramel tea. The box smelled delicious for a few days. The first step was to brew my tea. I used caramel, but any dark tea will work. 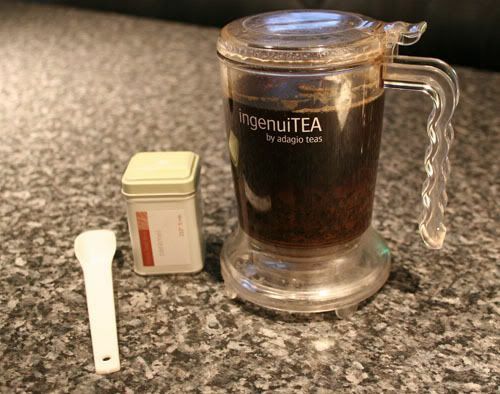 I over steeped it, so it would be nice and dark. 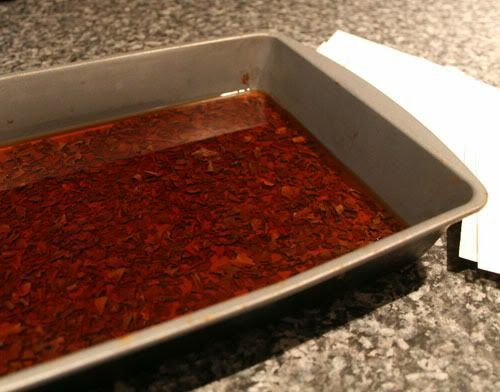 I poured it in an old cake pan. 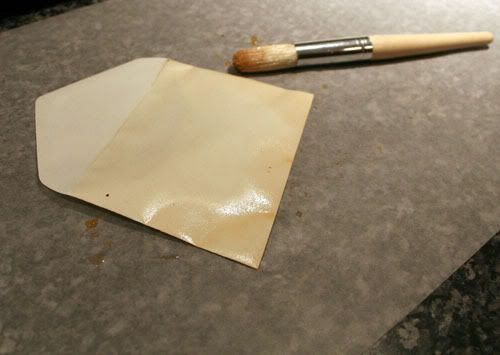 I protected my work surface with wax paper. Tea and coffee stain -- stained counters are no fun. I used a brush to "paint" the front and back of the envelopes. I scooped little bits of the leaves onto a few envelopes. They create neat variations in color. I avoided painting the underside of the flap because I didn't want to wet the adhesive. I very lightly painted the top side of the flap. I didn't want to saturate it. I just wanted to give it a little color. 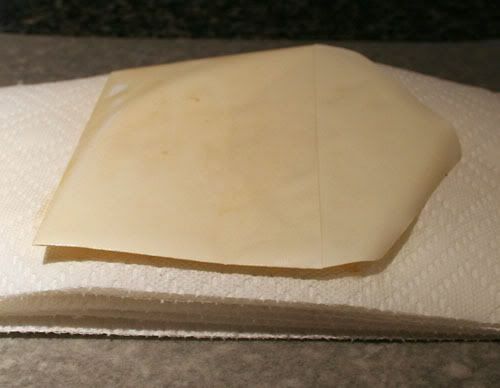 I put a piece of paper towel on a piece of wax paper and began stacking my envelopes for drying. A dozen or so envelopes later, I had a fairly large stack of tea-colored envelopes. I used another piece of wax paper on the top of the stack and weighed down the whole pile with a large book. 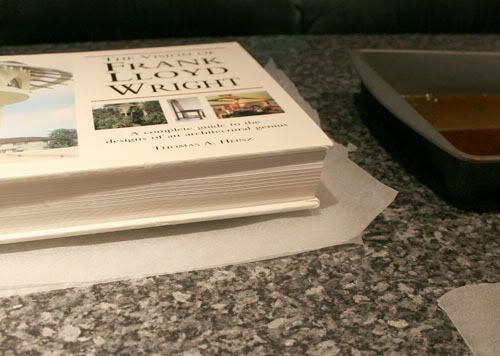 The weight of the book keeps the paper pressed firmly and allows them to dry without wrinkles and warping. I let them dry overnight in the stack. The next day I decorated them with stamps, watercolors, writing, etc. My favorite envelope was the top envelope. I held a piece of lace over it and stippled red ink through it like a stencil. It's a pretty neat effect. Optional: Embellish the top envelope with postage stamps, markers, stickers, stamp pad, gold foil, etc. 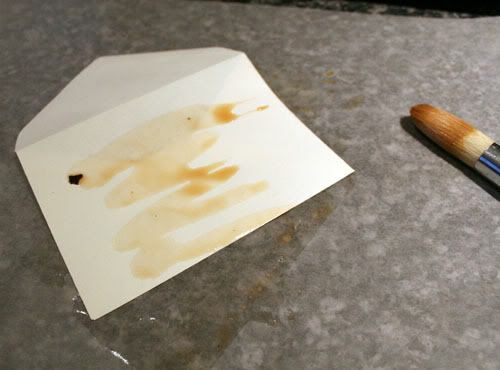 Antique or age the envelopes with tea or coffee, a shallow pan or dish, water and a paintbrush. Optional: Antique all the envelopes and then decorate the envelopes that form the top and bottom of the box with stamps, stickers, etc. before step 1. 1. To make the envelope fillers, trim a rectangular opening in one of the boards to create a template. Leave at least 1 to 1 ½” on all sides. Trace the rectangle onto nine of the other boards, slightly turning the template with each tracing. Cut out all the rectangles. 2. Apply a small amount of glue to both sides of a solid board and slide into the envelope that will be the bottom of your box. Seal the envelope. Repeat for the envelope that will be the top of your box. 3. Glue the remaining boards which have rectangular openings into all but one of the plain envelopes. 4. Trim away the center paper on all but one of the plain envelopes. 5. On the remaining envelope, cut the center corner-to-corner. Carefully trim away the lower layer of envelope, then fold under the top layer, forming a clean edge around the inside opening. Tape the flaps of the top layer to the underside. This will be the top envelope to the box compartment. It should now have a clean, smooth opening in the center. 6. 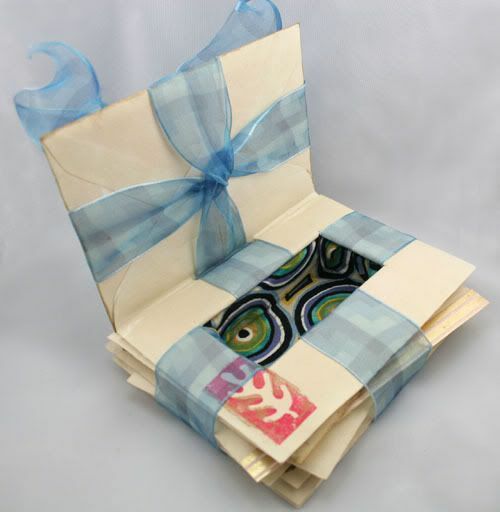 Place the bottom solid envelope bottom side down and begin to glue the envelopes with openings into place in a stack. Lay each one on top of the next, aligning the center openings. The outer edges will be slightly irregular as you build the stack. Glue together all but the top two envelopes. 7. Line the box inside. Cut a lining from decorative paper or fabric to fit the bottom and sides of the opening. Let a little bit wrap up and over the top edges. Glue the lining into place. 8. Add two pieces of ribbon around the bottom and sides of the box. Attach an end of one piece to the top inner edge and another to the left inner edge. 9. Apply tape to the top of the stack, then wrap the ribbon up and around the outside and tuck under the inside top edge of the opposite side. Leave some extra hanging out so you can tighten the ribbon. 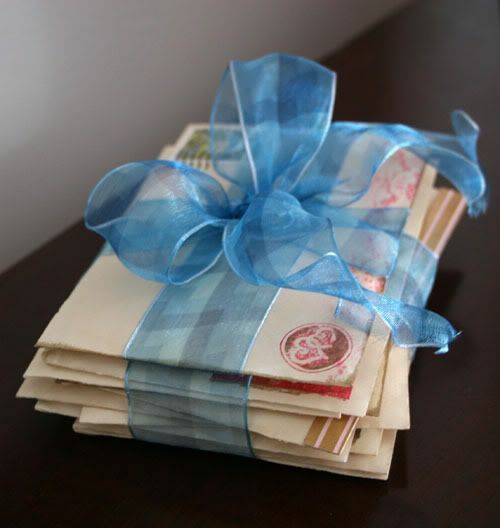 Set this top envelope in place, and snug the ribbon pieces. Trim off any extra ribbon. 10. Tie the remaining ribbon to form a centered bow onto the lid envelope. Be sure to line up the ribbons on the lid to the ribbons on the box. 11. Open an extra envelope and cut off 3/4 inch from the top edge to form a hinge for the box. 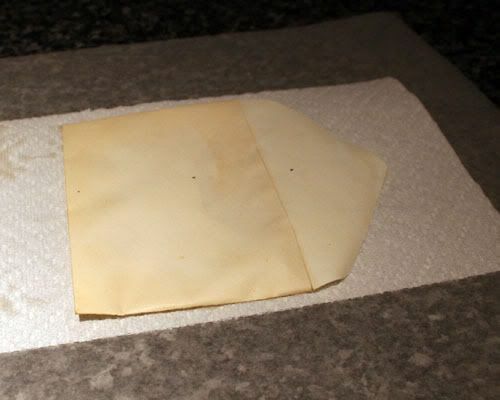 Glue in place over the flap of the lid envelope; then glue the remaining strip to the inner top envelope to form a hinge. That's it! Your keepsake box is now complete. I just love this! Thanks for the tutorial! Thank you, Batty! And you're welcome, too! Great job! I really love the lining! I am on a big "romantic" kick lately. I may have to give this a try! I love my little secret box! Thanks again, sweets! Thank you! I thought the lining would be a crazy fun pop of color in an otherwise mellow project. I was thinking I was a bit late for Valentine's, but it's never too late to spread some love. They are so pretty, the ribbon adds such a nice touch! "Happiness is just having something to look forward to"
Thanks! I really like that ribbon. Sweets! Yours turned out so much better than mine did! I have my envelopes stained and ready to stamp and decorate a new one but they are just sitting around for now till I have time to really work on them!